Charles Tyldesley appears on the Army List for 1798 as a First Lieutenant with a date of 29 October 1795. This is Charles Tyldesley the younger, who was born in 1774, and so had just reached the age of 21 when he bought his commission. He was the great-great-grandson of Thomas Tyldesley 1657-1715, the Diarist. Charles Tyldesley served as First Lieutenant under Captain Martin on the Irresistible at the Battle of Cape Vincent on 14 February 1797. The tactics adopted by Admiral John Jervis and Commodore Horatio Nelson ensured decisive victory against the Spanish fleet despite the British ships being outnumbered 27 to 15. 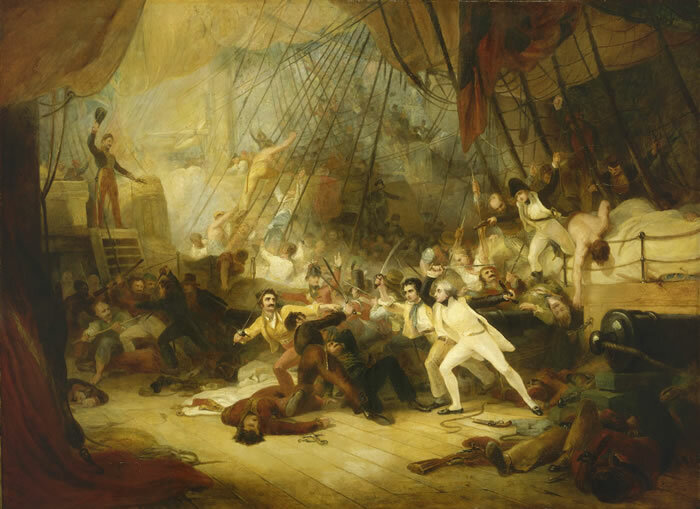 At around 5.00pm, in the aftermath of the battle, Nelson moved his pennant from the Captain, to the Irresistible. It was success in this engagement which led to Nelson being knighted, promoted to Rear Admiral of the Blue and receiving an honorary appointment as Colonel of the Marines. In 1799, Nelson's attention was on Naples where the French still held Fort St. Elmo. A force including Lieutenant Charles Tyldesley led an attack on the fort which met with success in July [FN1]. Early in 1800 Lieutenant Charles Tyldesley, Adjutant, was one of a battalion of Marines which landed at Malta, with La Valette capitulating in September of that year [FN2]. Under the command of Sir Ralph Abercromby, Charles Tyldesley was an Adjutant in the battalion of Marines which landed in Aboukir Bay on 2 February 1801 [FN1]. After engaging the French forces on 14 February, they marched to Aboukir, taking place in the siege which ended with the capitulation of the French garrison on 18 February. In 1808 Captain Charles Tyldesley commanded 400 Marines left to garrison Marie Galante after its capture from the French [FN3]. Conditions were poor, sickness and disease were rife and there was the constant threat of counter-attack by the French. Charles Tyldesley died on Marie Galante later that year, though whether the cause was ill-health or enemy action is not yet known. He left a will which contains little in the way of family detail, though sufficient to confirm that this was Charles Tyldesley the younger. A transcript is available in a later posting. As noted in an earlier posting, when the wife of Charles Tyldesley the elder died in 1787, his profession was noted as "Captain". Charles Tyldesley the elder also appears in the diary of Captain William Owen R.N who notes that on 8 February 1770 he "went to Liverpool, accompanied with Mr Charles Tyldesley". So it is possible that there was a longer-standing maritime connection.